Progressive jackpot slots account for some of the most popular games offered at any online casino, with players flocking by the droves to try their luck at these potentially life changing games. With jackpots starting in the hundreds of thousands and growing well into the millions, these real money slots offer some of the biggest prize pools you’ll find on the Internet. We explain more about how progressive jackpots work and the most popular progressive slots available online. What is a progressive jackpot slot game? For those unfamiliar with the concept of progressive jackpot slots, these are games which come with a standard base jackpot, which increases any time the game is played anywhere across the linked network. As jackpots grow, more players try their luck, feeding the prize pool even further. Progressive jackpots can be linked within a single online venue, or within a particular game offered at multiple online casinos. These highly sought after games have accounted for some of the biggest wins on the Internet, with some lucky players walking away instant multi-millionaires. If you’re looking for high-stakes slots online, we’ve provided an overview of the biggest and best jackpot slots you’ll find at reputable, safe online casinos like the ones recommended on our site. These games are the biggest money makers and have been responsible for some of the biggest recorded wins ever taken at online casinos. Unlike most other online slot games which can be sampled for free in demo mode, it’s worth noting that some progressive jackpot slot games require real money bets in order to play. Our top-rated online casinos offer a range of safe deposit methods which are processed on the spot, so you can start playing progressive games right away. Mega Moolah is the messiah of the online progressive network, creating more instant multi-millionaires than any other online casino game. This slot has been around for years and is starting to show its age in comparison to the newer, more highly animated games, but it doesn’t stop players from all over the world from placing spin after spin on this highly lucrative game. Following an African safari theme, Mega Moolah is a cheerful slot which takes us to a wildlife park where we see lions, giraffes, elephants, monkeys and more spin across the reels in hopes of randomly triggering the progressive jackpot wheel. The wheel consists of four possible jackpots: the mini progressive (base of $10), minor progressive (base of $100), major progressive (base of $10,000) and the mother of them all, the mega progressive (base of $1,000,000). The higher bet you have in place, the higher your potential jackpot reward. 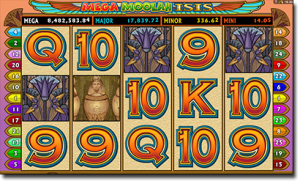 Mega Moolah Isis follows the exact same format as the original Mega Moolah, and shares the same progressive jackpot network, the major difference being this slot uses an ancient Egyptian theme centred around the Goddess of Isis in the hopes she will bring you good fortune. Symbols are made up of exotic Egyptian artefacts like orbs, hawks, lotus flowers, ankhs and other ancient relics. The current values of the mini, minor, major and mega jackpots are listed in the columns above the reels, and updated in real time so you always know what you stand to win. Mega Fortune once held the Guinness World Record for the highest ever amount won from an online slot game, before Mega Moolah came and hit it off its pedestal in 2015, but it continues to pump out million dollar wins and remains one of the most popular jackpot slots. Developed by Net Entertainment, Mega Fortune gives you a taste of the life you could live if you trigger the jackpot, loaded with fast cars, expensive liquor, diamond studded jewellery and Cuban cigars, with a kind of gangster vibe. 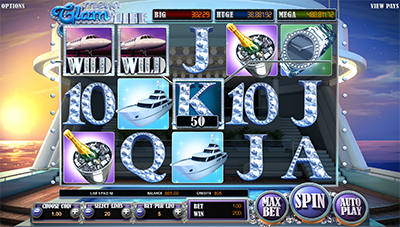 Landing three or more bonus symbols anywhere across an active payline triggers the bonus wheel, which holds the mega jackpot, minor jackpot and rapid jackpot. 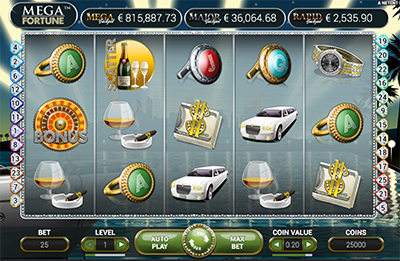 The current values of each jackpot are listed at the top of the reels, increasing in size before your very eyes. Hall of Gods is a popular NetEnt progressive slot game which uses a Nordic mythology theme, featuring the gods Odin, Loki, Thor, Freya and Idun. Along with a progressive jackpot, the game contains wild and scatter symbols to increase winning potential, with up to 20 free spins available with all wins tripled. An appearance of three or more of the bonus hammer symbol triggers the jackpot bonus, where you’ll be required to use the hammer to smash in 15 different shields. As soon as you’ve matched three symbols, you win that prize, which can either be a pre-determined value or one of the three progressive jackpots. Mega Glam Life is a recent addition to BetSoft’s collection of 3D slots and is making strong waves amongst online players. Based on the older BetSoft game, The Glam Life, Mega Glam Life boosts the original into the modern age, using the strikingly detailed animation these 3D slots are known for. Like NetEnt’s Mega Fortune, Mega Glam Life provides a glimpse into the high life, filled with Ferraris, private jets, champagne and diamonds. Earning three bonus symbols across reels two, three and four will trigger the Bonus Wheel, which you spin for the chance to win extra credits along with one of three tiered progressive jackpot prizes. Although the BetSoft progressive network is nowhere near as big as NetEnt or Microgaming, there’s still some huge prize pools up for grabs. Along with the progressive jackpot, Mega Glam Life is packed with bonuses like free spins, re-spins, multipliers and wilds to add to its appeal. Created in 2005, this Net Entertainment jackpot slot definitely shows its age, but it doesn’t seem to be a deterrent for thousands of online players who continue to push the jackpot into new heights. 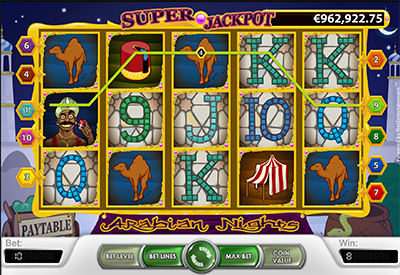 The exotic Arabian themed game attracts players more for its winning reputation than its graphics, with an average win of around $2 million claimed every 3-4 months. Five or more of the genie wild symbol triggers the games jackpot, while three or more lanterns award 15 free spins with all wins tripled. Progressive jackpot slot games are offered at a majority of the leading online casinos, with the selection varying between each venue, but unfortunately not all games are available to all players. Certain region blocks mean some progressive jackpot games have been restricted from players from certain countries, so you may be limited in your offering depending where you are playing from. For a full list of the top-rated online casinos that cater to players from your country, refer to our casino table at the top of this page. This table has been geo-targeted to recognise your location and only recommend casinos that accept players from your area, so head to any of these trusted sites to sign up for a real money account and start trying your luck on the progressive jackpot slots on offer.